September 4, 2017: When heritage meets craftsmanship, it results in Swarovski’s unsurpassed ability to renew itself in the utmost respect of its brand DNA. Crystal cutting expert, master of light and sparkle, glamour booster, Swarovski adds its fashion signature to make every day extraordinary and permit women to express their personality through inspired accessories, from day to night. To best encounter its collections, Swarovski invites women to live a real experience in its 2500 stores worldwide. An experience which is now possible in Jeddah at the Red Sea Mall, in a sophisticated and elegant atmosphere reflecting the brand’s iconic facets and plays with light, women can enjoy the whole Swarovski universe comprising fashion accessories, home objects, watches and men’s pieces as well. 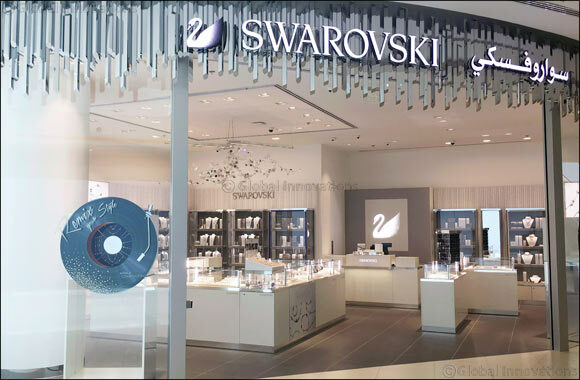 As the world largest retailer, Swarovski aims at offering its customers a delightful experience when they visit any store whether it is in Europe, Asia or Latin America. The Crystal Forest boutique concept is a modern expression of the company’s identity and values, highlighting the infinite possibilities of crystal and illustrates the company’s deep affinity with nature. For Robert Buchbauer, member of the Swarovski Family and of the Executive Board, “Our boutique design is not only a tremendous illustration of Swarovski’s contemporary vision and taste for design, this environment is perfect for us to share our commitment to excellence, sense of creativity, surprise and delight. From the outside, using a myriad of stainless steel prisms, to the inside where walls are textured with reflective white relief prisms of various lengths, everything was chosen so as to create a modern yet welcoming design. This new boutique at the Red Sea Mall is Swarovski’s 6th in the city of Jeddah. Outside the boutique, the concept interprets the ‘Crystal Forest’ using a myriad of stainless steel prisms. This sparkling facade takes on the lights and reflections from the street. The unfolding metal facets intrigue with their infinite depths and rich abundance. Fascinating windows are designed to create a connection with passers-by. Adding vibrant touches of colour, a seasonal visual conveys a strong fashion message and highlights trends and must-have products. Light and floating window boxes create eye-catching scenes starring Swarovski jewels and decorative objects. Inside the 32 sqm boutique, surface turns substance as the ‘Crystal Forest’ comes to life - all walls are textured with reflective white relief prisms of various lengths. These faceted, multi-layered elements create visual depth and exude an internal rhythm that follows the rules and rituals of nature. An interplay of vertical and horizontal showcases is integrated into the relief walls to present products in their element. The interior instantly embraces consumers with a crystalline feeling they will find in all newly fitted Swarovski boutiques. The atmosphere conveys a refined universe with recurring signature elements such as an impressive Crystal Swan behind the cash desk and Crystal Strand panels at the entrance. To complete this elegant interior, an exclusive lacquer developed for Swarovski adds a glowing sparkle to furniture, whereas the mirror finish is in stainless steel. Completing these striking elements, a modern art installation hangs from the ceiling embodying Swarovski’s creativity and sense of innovation. Lighting is a key feature of the architecture. The ambient lighting creates a soft atmosphere within the boutique. In a captivating play of light and shade, the gleam from the LED illumination in the showcases hits figurines and jewellery from multiple / limitless angles causing the forest to be bathed in the infinite-light of crystal.